A small fort situated on a small nose of land and consisting of a stone wall surrounded, at a slightly lower level, by a rampart with an external ditch. The wall, now represented by a low mound of stones about 12' (3.7m) wide in which no facing stones can be seen, has enclosed an oval area 80' (24.4m) NE-SE by 65' (19.8m) with an entrance on the south. A modern break occurs about 10yds (9.1m) west of the entrance. The rampart consists of a low rubble mound 12' (3.7m) wide and 1' 7" (0.48m) in maximum height where it is best preserved, on the west. There is a gap 60' (18.3m) long on the NE arc, though the ditch is continuous, 3' (0.9m) deep and 12' (3.7m) broad. The entrances of both ditch and rampart coincide with that of the inner wall. A bay in the crest of the steep east flank of the site interrupts the line of the rampart and ditch. There is nothing to show whether this is original or whether it is due to land-slip. There is likewise nothing to show that both defensive systems are contemporary, though there is no reason to suppose they are not. The interior is planted with trees and contains no recognisable features. R W Feachem 1963; Information from RCAHMS marginal land survey (NMRS, ABD/4/1-3). 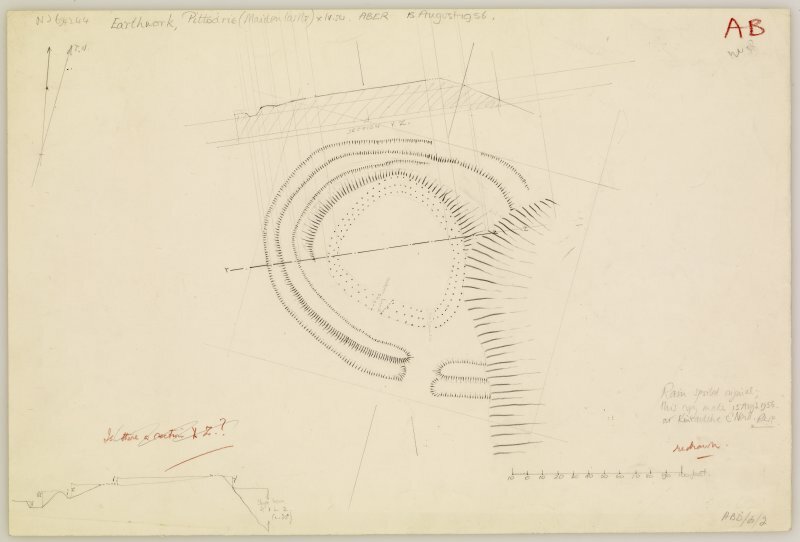 A fort with outworks generally as described and planned. The outworks are well-defined but the fort wall has been severely robbed and the interior mutilated by several recent trenches. Visited by OS (ISS) 23 July 1973. Visited by OS (JM) 17 August 1976. This fort is situated on a small N- and NE-facing nose at an altitude of 205m OD; the ground falls away sharply to the N and NE. The vegetational cover is open woodland, beech trees and tussocky grass. NMRS, MS/712/60, visited 19 January 1978. This fort is situated in beech woodland at the N end of a rocky spur that projects from the foot of the NE flank of Bennachie, some 350m NW of Pittodrie Home Farm (NJ62SE 12.01). The defences incorporate the remains of what are probably two successive enclosures, the earlier comprising a rampart with an external ditch, and the later a thick stone wall. The earlier fort measures about 40m from E to W by 35m transversely within a grass- and tree-grown rampart spread up to 3.5m in thickness and 0.5m in height. The external ditch is up to 5m in breadth and 1m in depth on the S, but it is of considerably slighter proportions on the N, where the line of the rampart has been reduced to little more than a scarp. On the S and W there is also a shallow internal quarry scoop immediately to the rear of the rampart. The defences do not form a complete circuit, however, and on the NE and SE they rest on the edge of a natural escarpment that has been trimmed back by minor quarrying activity. The entrance is on the S, the easiest line of approach, and is marked by a well-defined gap in the rampart and a causeway across the ditch. The later enclosure occupies most of the interior of the fort, and on the S the rubble from its heavily robbed wall is spread across the line of the earlier quarry scoop in the rear of the rampart. The enclosure measures about 20m in internal diameter, and its wall now forms a stony bank up to 4.5m in thickness and 0.6m in height. The entrance is not visible, but it was probably on the S, making use of the gap in the earlier defences. Although the wall has been heavily robbed, some of the pits and trenches along its line and within the interior appear to be the remains of undocumented archaeological excavations. Visited by RCAHMS (JRS), 8 May 1996. NJ 6942 2435 The RCAHMS volume on Strathdon identifies six types of hillforts based on size and defensive systems. However, none of the sites has been dated. The Hillforts of Strathdon Project aims to recover dating evidence from one of each of the six classes of hillfort. (Ditch 1) enclosure within which was a stone-built roundhouse (Wall 1). A series of trenches were excavated across the site. These revealed a complex sequence that included a previously unknown backfilled inner ditch (Ditch 2) and bank (Bank 2), which was capped by a cobbled surface running around the roundhouse. The roundhouse wall had collapsed and a smaller circular structure had been constructed, revetting the primary structure's collapse (Wall 2). In additional, there was a build-up of around a 0.8m depth of sequenced cobbled surfaces and midden material between the outer face of the roundhouse and the inner bank. Finally, a fragmentary furnace appeared to have been cut into the upper surface of the inner bank. Archive to be deposited with RCAHMS. Funder: AOC Archaeology Group, The Society of Antiquaries of Scotland, The Mackichan Trust, The Hunter Archaeological Trust, Glasgow Archaeological Society and the CBA. Murray Cook, Lindsay Dunbar and Rob Engl, 2007. This fort stands at a height of 690 feet OD 550 yards NW of Pittodrie House on a broad, level tongue to north and east of which irregular rocky slopes fall away to the easier ground 70 feet or 80 feet below, while to the west uneven wooded land descends more gently towards Boghead farmhouse. The structure consists of a stone wall within a rampart and ditch, the wall enclosing an oval area which measures 80 feet in length from south east to north west by 65 feet transversely. Only a low mound of stones about 12 feet in width now represents the wall, and no facing stones could be seen. The entrance is in the south, a modern break occurring some 10 yards west of it. The wall was built on a slight elevation and the rampart and ditch lie at the foot of this. The former consists of a low rubble mound which, where best preserved, in the west, attains to a height of 1 foot 7 inches above the level of the base of the elevation upon which the wall stands and to 5 feet 6 inches above the bottom of the ditch which here lies 3 feet below the surface of the ground outside. The rampart and ditch each measure 12 feet in width. The bay in the crest of the steep east flank of the site interrupts the line of the rampart and ditch, and there is nothing to show whether this was originally the case or whether the gap is due to land slip. There is, however, also a gap 60 feet in length in the NE arc of the rampart although the outer ditch is continuous. The entrance in the outer works conforms to that of the wall. The interior is planted with trees and contains no recognisable features. Visited by RCAHMS (RWF) 15 August 1956. 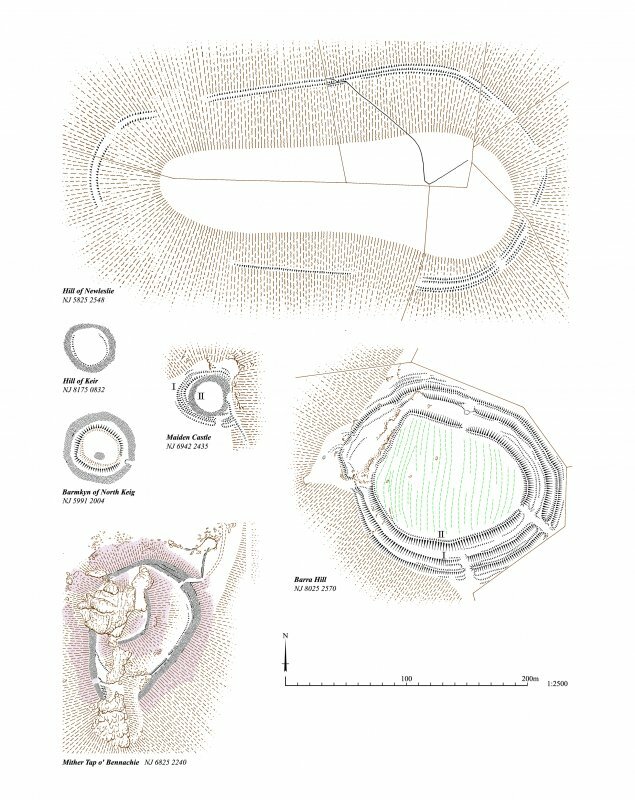 NJ 6942 2435 The RCAHMS volume on Strathdon identifies six types of hillforts based on size and defensive systems. However, none of the sites has been dated. The Hillforts of Strathdon Project aims to recover dating evidence from one of each of the six classes of hillfort. The initial season (18-29 June 2007) focused on Maiden Castle. The castle consists of a small bank (Bank 1) and ditched (Ditch 1) enclosure within which was a stone-built roundhouse (Wall 1). A series of trenches were excavated across the site. These revealed a complex sequence that included a previously unknown backfilled inner ditch (Ditch 2) and bank (Bank 2), which was capped by a cobbled surface running around the roundhouse. The roundhouse wall had collapsed and a smaller circular structure had been constructed, revetting the primary structure's collapse (Wall 2). In additional, there was a build-up of around a 0.8m depth of sequenced cobbled surfaces and midden material between the outer face of the roundhouse and the inner bank. Finally, a fragmentary furnace appeared to have been cut into the upper surface of the inner bank. 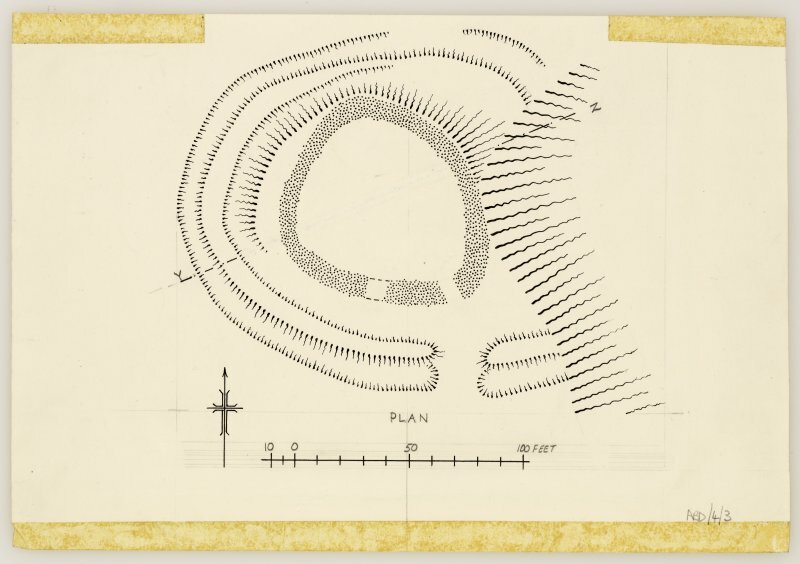 NJ 6942 2435 and NJ 61215 28167 The RCAHMS volume on Strathdon identified six types of hillforts based on size and defensive systems. However, none of the sites have been dated. The Hillforts of Strathdon Project aims to recover dating evidence from one of each of the six classes of hillfort. The second season, 21 July–1 August 2008, returned to Maiden Castle and opened a single trench on Dunnideer. The work identified a secondary rectilinear structure in the interior which was overlain by a soil layer onto which a post-built structure, associated with paving was constructed. Finds included crucibles, an unfinished stone bead, a glass bead and decorated glass sherd. The work identified the inner face, recovered charcoal from the destruction of the site and confirmed that the rampart was at least 4m wide. Funder: AOC Archaeology, Aberdeenshire Council, The Mackichan Trust, The Hunter Archaeological Trust, Glasgow Archaeological Society and the CBA. 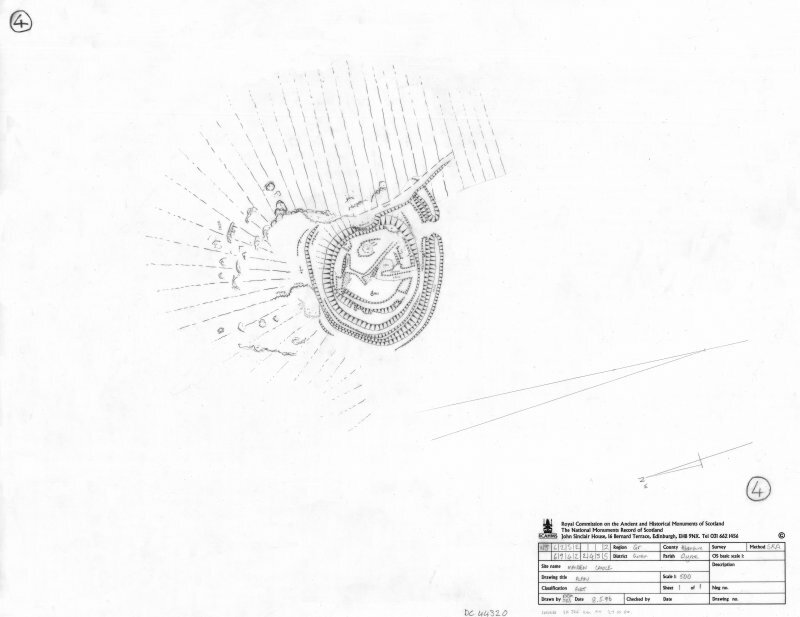 This small fortification is situated on a low hillock that projects from the slope NE of Pittodrie Home Farm to capitalise on the steep slopes falling away on the N and more particularly the E, where there is also evidence of minor quarrying. On the surface the fortifications comprise a single rampart and ditch overlain by a heavily-robbed, circular, stone-walled building measuring about 20m in diameter within a wall 2.5m in thickness. Excavations by Murray Cook (et al 2007; 2008), however, have revealed that the traces of what appears to be an internal quarry scoop to the rear of the rampart on the W is the remains of an inner ditch with an internal rampart enclosing an oval area measuring about 35m from E to W by 29m transversely (0.08ha). Adjacent to the entrance on the S, the outer ditch is up to 5m in breadth by 0.5m in depth, reducing to slighter proportions around the steeper N flank, and the rampart forms a bank 3.5m in thickness by 0.5m in height, but on excavation these proved to be 3m wide by 0.75m deep and 4m thick by 1.6m high respectively, while the inner ditch measured 2.2m in breadth by 1.1m in depth and the inner rampart 2m in thickness by 1.5m in height. Apart from evidence of non-ferrous metalworking, a piece of early medieval decorated glass and a glass bead, there are three radiocarbon dates from contexts below and above the inner rampart, and beneath the wall of the circular internal building, all of them falling in the range of AD 410-640. 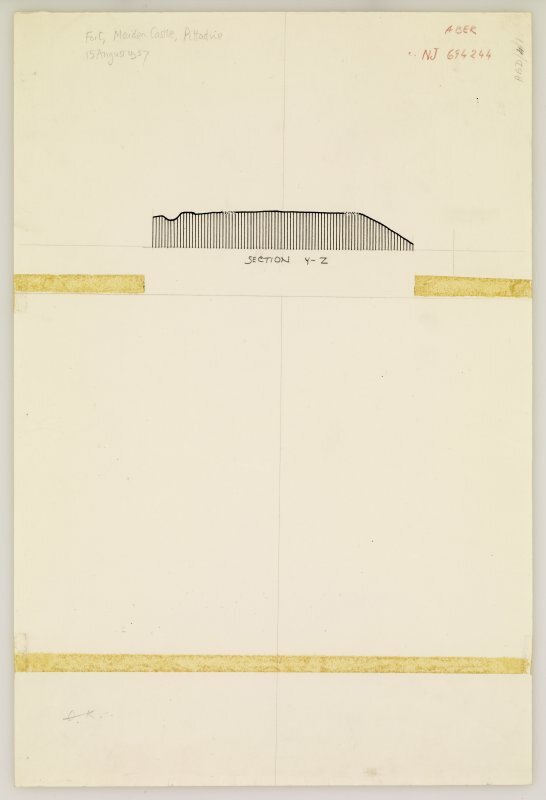 Secondary rectilinear structures were identified in the trenches in the interior.